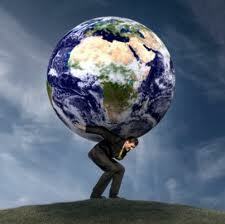 I feel like I have the world on my shoulders! I posted a recent blog in a group on LinkedIn. The title of the post was “How restaurant catering is changing the balance sheet of America”. Well, here is what one group member posted about a day later. From a caterer. A very upset caterer! If you are interested in my responses and the conversation that ensued, check out this link here. I am curious to hear your thoughts? Do you think that restaurant catering is killing the catering industry? As a restaurateur, this comment makes me want to do catering even more!! How about you? Restaurants serve as one critical entry point for people who have never before tried catering. As a luxury off-premises caterer, I look at all entry points very carefully – whether the prepared foods counter at the local grocery store or the large retailer who sells frozen meatballs by the pound or the restaurateur who is looking for a secondary revenue stream. These companies educate and inform my future clients. Sharing Best Practices with them is of vital importance – we want happy, well-educated customers when they’re ready to purchase our services. Great thoughts Patrick… thank you for taking time out to share this. I also feel that education in this market is key to everyone’s ultimate success. Erle, not able to yet read the entire text of your discussion, but at a high-level I can sympathize with where the caterer is coming from as I have heard it from some of our caterer partners as well. And this is exactly why a company like yours with an emphasis on training I think can be a huge positive for the community in making sure that restaurants execute like the experienced catering companies when it comes to drop-off catering. Restaurants do have a huge advantage over caterers due to their brand recognition, but that will only last so long for Customer ABC if they do not execute properly! Look forward to reading the rest…. Here is the whole conversation…..
For the companies that are strictly off premises caterers – Restaurant Catering is a nightmare for us – their chefs have no idea how to cater, just like I have no idea how to run a restaurant. Everytime a client tells me about a disaster, it was from a restaurant trying to be a caterer. STOP YOU ARE KILLING OUR INDUSTRY!! Thanks for your note Michelle. I think this is a very interesting topic for debate. There are amazing restaurateurs that have fantastic catering operations. Wolfgang Puck and Danny Meyer come to mind as more visible ones. Whilevonam not a proponent for being all things to all people, I feel that your statement is way off base. Catering out of restaurants is tricky business for sure, and I am not proposing that every restaurant should cater. I’m simply suggesting that through some standardization and perhaps certification, more restaurants could extend their services more professionally into the catering space. I’m sorry you feel that I am “killing your industry” but perhaps you should slow down a bit and consider your statement again. I can see why your response is to protect a higher standard, and I am the first one to agree with you that not all restaurants should consider catering bust the ones who commit to doing it well. Perhaps you can make some room in “your industry” for restaurateurs that want to be great caterers as well. I know for a fact that if as a caterer, you wanted to open a restaurant, you’d be greeted by the industry with open arms. I hope you will consider these thoughts and perhaps widen your perspective just a bit. Thanks for your reply Erle, but after 29 years in the business, I’m hard pressed to agree – Puck gets business because people like to brag that he’s doing their food – does that make him a great caterer? I’ve had clients tell me that the food I did for the Rehearsal Dinner was way better than the food they had at the wedding from the Ritz for example. Not only do restaurant caterers cost the clients more money – they bring nothing but the food so now the client has to rent every little thing from Chafers to platters to salt/pepper shakers, etc. And you want the table to look amazing – well now you have to hire a decorator because Restaurant Caterers only come with the food. Sorry Erle – you will never convince me – and sure you might greet me with open arms if I try to open a “restaurant” but 4 out 5 fail in the first year – so the odds are stacked against me. Everyone wants to be the Caterer – which it just bad for the true Caterers of the world. Thanks Michelle…. I think there is a great conversation to be had here on what is the definition of “catering”. I don’t disagree that catering, as you define it for events, is out of the expertise of most restaurants. I wouldn’t recommend that venture to any restaurants. Saying that, there is an elements of “drop-off catering” that most restaurants could execute given the right training, certification and standardization. This would be focused on the boardroom table as an example. To fill the demand for lunch time catering in the boardroom, I think that restaurants could do a great job in that niche. So perhaps, we could agree to disagree and perhaps as customers become more sophisticated, there is is further market segmentation that needs to happen. In this scenario, restaurants could reconsider their business strategies as it relates to catering and let the professional caterers, such as yourself, handle the very complex execution of event catering and restaurants could simple focus on the category of catering drop off. Maybe that’s one way to attack this market challenge. Thanks for taking the time to have this conversation. • If it was only that simple – my bread and butter comes Monday thru Friday from Corporate Catering and right now that is on the decline – I’m in LA near LAX with all the Boeings, Raytheons, Northrops, Direct TV, etc – and all of their budgets have been cut – My business has gone down $300K since the economy took a nose dive – so now I have to compete with not only other caterers hungry for business, but restaurants – why? – they have a brick and mortar facility and I don’t – so I am the one getting screwed – not them they still have people coming into the restaurant – but I don’t. I personally would like to see all restaurants focus on what they do best and give the struggling off premises caterers a break! The restaurant industry has the same challenges that you do. As business people, we are all looking for more sales and most businesses have seen a decline in business during the last 4 years or so. I am not sure what the answers are, except to say that markets (consumers) dictate. If customers are willing to purchase these services from restaurants, than, restaurants need to react to market demand. As a caterer, hungry for business, you too have to react to market demand for services. I think as business people, we can’t beat markets, just simply react to them, or try and predict them and go where we think the market will be. I am not sure you are “getting screwed” from anyone, especially the restaurant industry, but perhaps you need to look for creative ways to provide more services to your market in a way that makes sense for consumers. As a caterer, you have alot of flexibility in your operations (restaurants don’t) and as you struggle to find a market to sell too, it’s a matter of creating new products and services to meet the market demands. I think you face a big challenge as consumers look to their favorite restaurants for more services. There are 1 Million restaurants in the US, many of them suffering, and if they continue to create new services (such as drop off catering), and consumers purchase from their favorite brands, then as a caterer, you will need to adjust. It’s a tough scenario for sure, but I think that you need to change with the times or the result is to get left behind. Running a restaurant is not an easy task, and if restaurants begin to do a better job in this space, then you will need to compete hard. Just look at the volumes of a brand such as Panera in the lunch catering space. It’s a natural progression for them and they need the revenue to make the economics of their cafes make sense. I wonder what additional services your customers might want from you, as a caterer? Some level of service that restaurants just simply cannot compete in. Thanks for showing my conversation – curious that no other caterers responded? It’s a great and important conversation. Invite others to come take part. I am always transparent on these kinds of things because I believe that this is the kind of thing that makes it better for everyone.